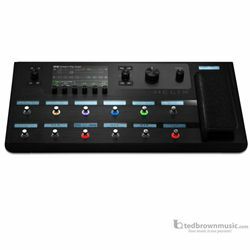 The Line 6 Helix multi effects floorboard processor reaches far beyond anything you've ever experienced. It can be a great addition to your rig, a streamlined controller for your existing system, or an incredible sounding guitar interface for recording in the studio it can even replace your entire effects setup! Equipped with Line 6's new HX modeling engine, Helix will let you hear brand-new models of modern and vintage amps, cabs, mics, and effects all designed to sound and feel amazing. And your rig integration options are limitless, with Helix's astoundingly comprehensive I/O and routing capabilities. Line 6 has long been at the front of the modeling revolution, and Helix is the professional guitar processor Line 6 was destined to make.